The torch has passed from Ancient Greece to LED with the Brightech Sky Glass LED Floor Lamp as it combines beautiful prestige, vintage retro vibes, and cutting edge technology to accommodate your living room décor without having to actually light any torches on fire or participate in the Olympic Games. The Sky Glass accent lamp brings a welcoming style into rooms without ever overstaying. LED lights never generate heat the way old fashioned halogen bulbs do, so they'll never make the room uncomfortably warm. The bright LED light is diffused by the artistically textured glass head to spread a smooth, even glow throughout the room unlike harsh, glaring overhead light fixtures. Using only 25 watts, the 3,000K color temperature glows at 2,100 lumens to provide plenty of light without overpowering sensitive eyes. When it comes to perfect lighting, everybody has their own preferences. This is why Brightech engineered the Sky Glass decorative lamp to have a 4 Step Dimmer power-button allowing you to customize the level of light ranging from ultra bright to ambient soft with the simple tap of your finger! The Sky Glass bedside lamp provides modern luxury at an affordable price while saving money on your electricity bill. Light-emitting diodes (LED bulbs) last longer and save more energy than traditional light bulb fixtures by using less power. This long-lasting innovative technology provides light for up to 20 years without having to deal with annoying bulb replacements every few months. 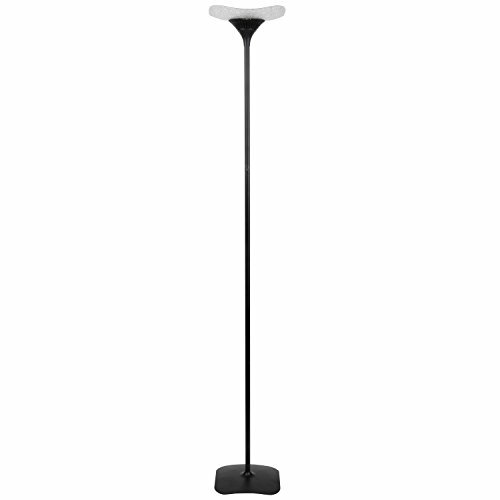 The Brightech Sky Glass LED Torchiere Floor Lamp provides easy to install lighting for renters, apartment leasers, dorm room dwellers, or even homeowners who might not have time to install more complicated light fixtures. No holes to drill, no sheetrock to cut, and no hassle to setting perfect lighting for any occasion! UNIQUE ART DECO STYLE & FUNCTIONAL DESIGN: This lamp features a designer textured curved glass head diffuser atop a sleek 70-inch pole. Its slender design allows for sliding unobtrusively into the narrowest corners, nooks, and crannies without taking too much space. This light also powers on/off easily featuring a 3 step dimmer so that you can create the perfect lighting. It is available in 5 finishes that blend well with contemporary, traditional, minimalist, art deco or ultra-mod décor. 20 YEAR LIFE & ENERGY SAVING: The Sky Glass LED Floor Lamp includes a power saving integrated LED light so that you will never have to replace a bulb as this lighting is made to last 20 years. Its advanced 3,000K warm white LED technology allows this lamp to outshine lamps that depend on short lived, energy consuming standard halogen or incandescent bulbs. Save money & energy !.